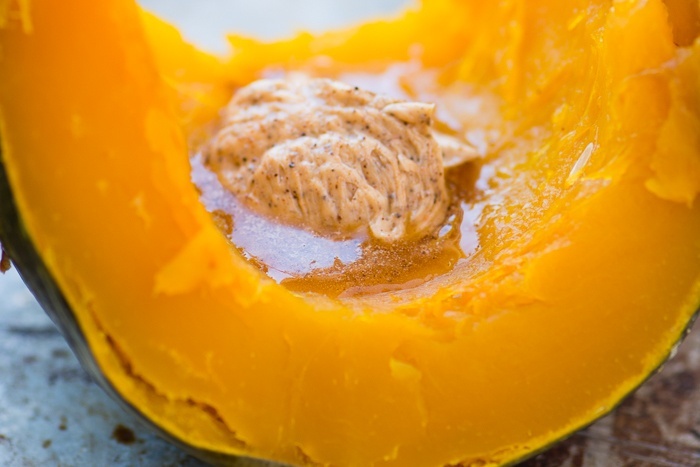 Make a grand entrance with my Whole Roasted Kabocha Squash with Chipotle Butter and 'carve' it right at the table --- then get ready for rave reviews. Set squash on a baking sheet and use a small sharp knife to pierce the top a few times. Bake for an hour, or until a sharp knife pierces the flesh easily. Slice wedges out of the squash and remove the seeds and fibers with a spoon. Serve hot with Chipotle Butter. To make the chipotle butter, mix the butter with the chili powder and blend until everything is completed mixed. If you used unsalted butter, add a pinch of salt to taste. Put the butter in a small jar and refrigerate until needed.